Those are very good questions. I’ll try to answer them today in this homily with the help of St. Thomas Aquinas, who is arguably the greatest theologian in the history of the Church. In this case, as Aquinas notes, our Lord defended himself. Physically speaking, he did not offer that guard his other cheek for him to slap. At other times during his passion, however, Jesus did suffer in silence, without defending himself verbally or in any other way. When, for example, the Roman soldiers struck him repeatedly on the head with a reed, Jesus said nothing. When the chief priests and elders made false charges against him—attacking him verbally—our Lord “made no answer” according to Matthew 27: 12. So it seems that sometimes Jesus did defend himself, and at other times he very quietly and very patiently endured physical and verbal abuse without defending himself in any way. And, of course, in both cases—both when he defended himself and when he didn’t—he harbored no hatred or bitterness whatsoever toward his attackers. Aquinas makes the point that, as disciples of Christ, we need to try to follow Jesus’ example here—as we should in every situation of life. Along with other great theologians like St. Augustine, Aquinas says that if we want to know how to follow a particular command that’s given to us in the Bible (like the command to turn the other cheek), we need to look and see how Jesus followed that command in his own life, and how the great saints of the Church were faithful to it in theirs. So the very fact that Jesus sometimes defended himself means that his command to “turn the other cheek” doesn’t apply literally to every situation and circumstance of life. Yet in all situations we must avoid hatred and vindictiveness, as Jesus always avoided hatred and vindictiveness. I was trying to think of an example of how all this would play out in the real world, and what came to mind almost immediately was the whole “gay marriage controversy” that took place in our state and town last year. All because I urged my parishioners to exercise their constitutional right of free speech by letting Senator Dennis Algiere know where they stood on the issue! I didn’t even tell people which side of the issue they should take—although I obviously thought that most would voice their support for traditional marriage. For this I was attacked in the Sun, in the Providence Journal (by columnist Bob Kerr), on the Buddy Cianci Show—and probably in a number living rooms and barrooms in southern New England. So I wrote a letter to the Sun about what I actually did say when I had urged parishioners to contact Senator Algiere. (The Sun’s writers had gotten the details almost totally wrong in their initial reporting.) I also accused them of “yellow journalism” and of trying to undermine my credibility as a religious leader in this community. And what was their response? Well, as some of you will remember, they actually gave my letter special status by making it the guest editorial on the day it was published! I believe there was a time to be silent in this situation—and bear the “slap on the cheek” for the sake of Christ and his Gospel; but I also believe there was a time to speak out and defend not only myself, but also the Gospel of Jesus Christ, and, to some extent, all of you (because all of you who made calls to Senator Algiere were implicated indirectly). Now, in both cases—both when I was silent and when I spoke out—I tried to act (as Thomas Aquinas would say) without being “inwardly stirred against the ones striking me.” And so I had to pray for the grace to love my enemies—because, as is the case with most people, my first inclination is not to love my enemies! I’m being totally honest here. Now, please don’t misunderstand me this morning, I’m not saying that I always do this perfectly in my life. Jesus was always silent when he should have been silent and he always defended himself when he should have defended himself. That’s because he was (and is) God. But I’m not God, and neither are you! We can easily get it wrong—and we sometimes do. We have to be humble enough to admit that. This is yet another reason why we need to pray every day—especially when we’re faced with one of these situations. Dear Lord, help me to know. Help me to know your perfect and holy will. Help me to recognize those moments when you want me to defend myself, and those moments when you want me to endure the “slap on the cheek” for your sake. My emotions will always tell me to retaliate when I’m offended in any way, but you call me to live by faith and not by my emotions. Enable me to know your will in this situation I’m presently facing. But, regardless of whether you’re calling me to defend myself right now or to be silent, help me to do so with love in my heart—the kind of love you always had in your heart, even for your enemies. Amen. Gold medalist Matthias Mayer of Austria, making his winning run in Sochi, Russia. God’s message to us today in this text from Matthew 5 (and in the other readings we just heard) can be summed up as follows: Develop an “Olympic attitude” in your spiritual life. Or, to put it another way, Be a spiritual Olympian! Many of us, I’m sure, have been watching the Winter Olympics in recent days, and marveling at the performances of these world-class athletes. They make activities that are extremely difficult look incredibly easy. But that’s not a coincidence! They do what they do as well as they do it because they are extremely talented, and highly trained—and because they have the right attitude of mind and heart. They each have a goal in view—a gold medal—and they pursue that goal relentlessly and with incredible focus and concentration. Which brings us to the gospel. Jesus makes it very clear in this passage from the Sermon on the Mount that this ultimate goal of human existence can be missed if we don’t pursue it like a “spiritual Olympian”; if we don’t have an “Olympic attitude” in our spiritual life. Well, did you see the men’s downhill ski race at the Olympics the other day in Sochi, Russia? It was incredible! That was one of the most difficult and treacherous racecourses I’ve ever seen. Some of the jumps those downhill skiers had to take sent them flying through the air for almost the length of a football field. And when they landed at speeds of 70 miles an hour—or more!—they sometimes had to make hard turns on the packed snow almost immediately (snow that was more like ice!). Now, I’m a pretty fair skier, and I rarely fall when I ski—but, in all honesty, I don’t think I’d make it past the first turn of that racecourse! I’d definitely get to the bottom of the mountain—but probably on a stretcher or in a body bag! When you ski a steep slope—even on a regular mountain—you have to stay forward on your skis. If you lose your concentration and start to lean back even a little bit (which is what most people instinctively want to do in a situation like that), you’re gone. You can be out of control in a flash. That’s what was so amazing about these Olympic downhill skiers. They had to have almost perfect concentration to stay forward on their skis and balanced as they flew down that mountain. And they had to overcome their human weakness (that natural tendency we human beings have to pull back when there’s a steep drop in front of us). If one of those skiers had let his guard down for even a millisecond, he not only would have lost his chance to win the gold medal (that’s a given)—he might even have lost his life. So what is Jesus telling us? He’s telling us that if we want to get on—and stay on—the road to eternal glory, we need to have an ‘Olympic attitude’ in our spiritual lives. We can’t ‘let our guards down,’ so to speak, when it comes to things like anger, and impurity and dishonesty. If we do, we could easily become like a downhill ski racer at the Olympics who gets casual about his run and gives in to the tendency to sit back on his skis. It can mean death—not physical death, but what’s even worse: spiritual death (which, without repentance, lasts forever!). That’s how to be a ‘spiritual Olympian’ and win the ultimate prize of life—which, by the way, is the only prize in the end that will really matter. I want to begin my homily today by recommending a movie to you. Specifically, I’ll recommend it to all those 14 years of age and older. The movie is called, “Gimme Shelter.” I saw it last week at Showcase Cinemas in Warwick. Unfortunately it’s not playing at the present time at Regal Cinemas in Stonington. But I would say that the trip to Warwick is well worth it. The film is based on a true story. It stars actress Vanessa Hudgens (who was in all those High School Musical movies of the recent past). She plays a 16-year-old girl named Agnes Bailey (although Agnes prefers to be called by her nickname, “Apple”). When the movie begins, Apple is living in the inner city with her drug-addicted and emotionally unstable mother. We also find out that the 16-year-old has been in several foster homes over the years, and was sexually abused in one of them by the father of the family. Needless to say, she’s a very troubled young woman. After getting into a physical fight with her mother, Apple runs away and goes to the house of her estranged—and extremely wealthy—father, Tom, who lives in a big mansion in a New Jersey suburb with his wife, Joanna, and their two young children. Because of her scruffy appearance and abrasive personality, Apple gets a pretty cold reception from her dad—and an even colder reception from his wife. But they allow her to stay. While she’s there she experiences morning sickness one day, and shortly thereafter makes the discovery that she’s pregnant. Tom and Joanna’s solution to this “problem” is simple and all too typical of people in the modern world. They tell the teenager that she should have an abortion. Apple, to her credit, dashes out the front door of the abortion clinic that Joanna takes her to—and runs away once again, this time to save the life of her unborn child. She ends up back on the streets for awhile, sleeping in unlocked cars and eating out of dumpsters to survive. But then, after a car accident puts her in the hospital, she meets a good, dedicated Catholic priest (you don’t find too many of them in Hollywood films these days! ), played by James Earl Jones. 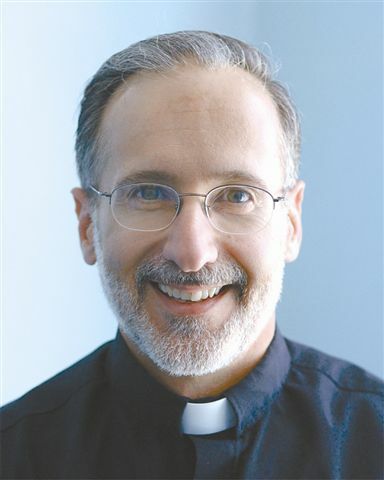 The priest (Fr. McCarthy) helps Apple to get the assistance she needs from a local pregnancy shelter: a home for young mothers and their babies, run by a woman named Kathy. This very important character, incidentally, is actually modeled on a real person, Kathy DiFiore, who began taking pregnant teenage girls into her home back in 1981. 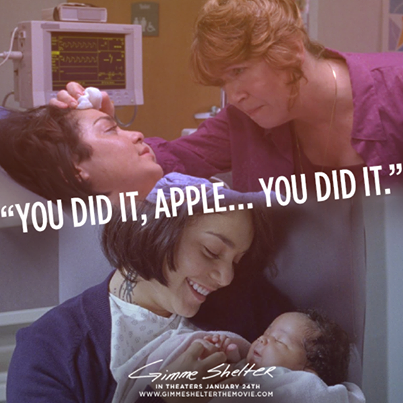 She now operates 3 mothers’ and babies’ shelters in New Jersey, giving love and hope to women like Apple. I won’t tell you how the film ends—no spoilers here!—but I will say that, all things considered, it’s a good and happy ending for most of the characters in the story. I mention the movie, “Gimme Shelter” in this homily, because I think it has a lot to teach us about being a “light” for others—the kind of light that Jesus tells us in this text that we must be. First of all, the movie teaches us that being a light is not always easy and it’s not always popular. It wasn’t easy for Apple to be a light by making the decision to carry her unborn child to birth. In all likelihood, if she had consented to the desires of her father and his wife and had had the abortion, they probably would have allowed her to stay with them, and Apple would have had everything she could possibly have wanted in life—materially speaking. It wasn’t easy for the priest, Fr. McCarthy, to be a light in his initial dealings with Apple right after her car accident. She was angry at God; she was angry at life—and she let the priest know it in no uncertain terms! And it wasn’t easy for Kathy to be a light by setting up and running a ministry for young and troubled teenage girls like Apple. Of course Jesus never said it would be easy! In fact, the implication in this Scripture passage is that it will not be easy, since a light stands out only when it’s surrounded by darkness. Another lesson we see illustrated in this movie is that we can be a light now and in the future, regardless of what we’ve been in the past. We learn that lesson, mostly, from Apple. Apple runs away from her mother because of her mom’s physical, emotional and verbal abuse, and because of her mom’s drug addiction; she runs away from her dad and his wife because they want to kill her unborn child by forcing her to have an abortion. And yet, in the midst of all those conflicts, it’s very clear that Apple is no saint either! To say she was “a little rough around the edges” is to put it mildly. The fact is she was angry, bitter, vulgar and not a very pleasant person to be around. At the end of the story, however, she’s very different. Her choice to be a light by continuing with her pregnancy—and by all the right decisions she made after that—had a positive impact on her and on those around her. She didn’t allow her past darkness to keep her from being a light for others in the present moment, and neither should we allow our past darkness to keep our light from shining. Instead, we should deal with our darkness by going to Confession, and then move on with our lives. And speaking of others, another lesson we learn in this film about being a light is that lights burn more brightly when they burn together. Apple was supported in her decision for life by Fr. McCarthy, and Kathy, and the other young mothers in the shelter—and that “union of lights” helped everyone, including Apple. This is why, if we’re serious about living our Catholic faith, we need to try to surround ourselves with other Catholics who are also serious about living their Catholic faith. And speaking of helping others, we also see in this story how being a light can bring sight to the blind—the spiritually blind. Apple’s decision for life—her decision to be a light in this very difficult situation she was facing—eventually ‘opened the eyes’ of her materialistic and very pro-choice father. He came to see that it was not an impersonal cluster of cells that his daughter was carrying in her womb; it was a real, living human person! And finally, we learn from this film that being a light for others must begin at home. I thought of this last point when I reflected on today’s first reading from Isaiah 58. You know, this passage could be entitled, “How to be a light”—because that’s exactly what it’s about. That, I would say, is a clear reference to our families. So yes, Isaiah is telling us that we should strive to be “lights” by helping all the poor and needy people out there in the world. But he’s also making clear that our charity and kindness need to begin at home! Of course, being a “light” at home by showing patience and compassion and forgiveness toward the other members of our family can be (and often is!) a real challenge. And we all know that by experience! That’s yet another reason why we need to pray every day. In concluding my homily now, I ask you to do two things. First of all, think of all the people who have been “lights” to you in your life. Thank God for those people, and ask the Lord to bless them for being such good examples of faith to you.